I first became acquainted the Matsushita (best pronounced Măt-sush-ta) companies back in 1996 when I negotiated a technology license with Matsushita Communications. 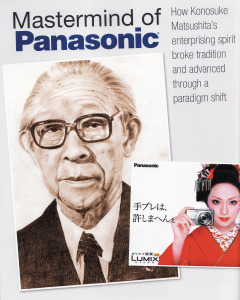 Most people in America know these Japanese companies by the brand name, Panasonic. I didn’t know much about them at the time, but in my study since then I’ve discovered that their founder, Konosuke Matsushita, was perhaps the prototypical agile entrepreneur and lean startup guru. He never called groups scrums, but he employed the principles that are the foundation for what we call Agile today. 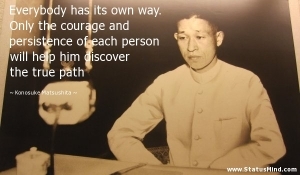 He started his company making electric sockets in 1917 with his wife, three friends, and 100 yen. The operations were in his small home with about 130 square feet (12 square meters) of working space. Being lean came naturally and out of necessity. He kept that philosophy throughout his life. In 1936 when his company was very large and successful, he wrote, “Any waste, even a sheet of paper, will increase the price of a product by that much.” This didn’t mean that he was averse to investing or spending where needed. He also said, “A policy of austerity will never bring prosperity.” He was a lean investor seeking efficiencies and the right products for his customers. By 1970, Matsushita Electric (MEI) was the most efficient large enterprise in Japan, more than Sony, Honda or Toyota. Agile principles have been around for a long time, and practiced by many before the Agile Manifesto was published. Konosuke Matsushita was one of the great agilists of all time. In my next posting, I’ll review his approach to strategy and leadership.